Jelly, to me, is one of those summertime treats. There’s nothing like a cold tub of jelly melting on your tongue as you melt in the heat. Well, I think it’s time to take the jelly game up a notch. How about, SPARKLING JELLY? I was first introduced to this nifty trick by my friends Peter and Cayte – turns out that if you mix in a sparkling drink instead of cold water into jelly crystals, you get a lightly sparkling jelly that makes your tongue tingle! 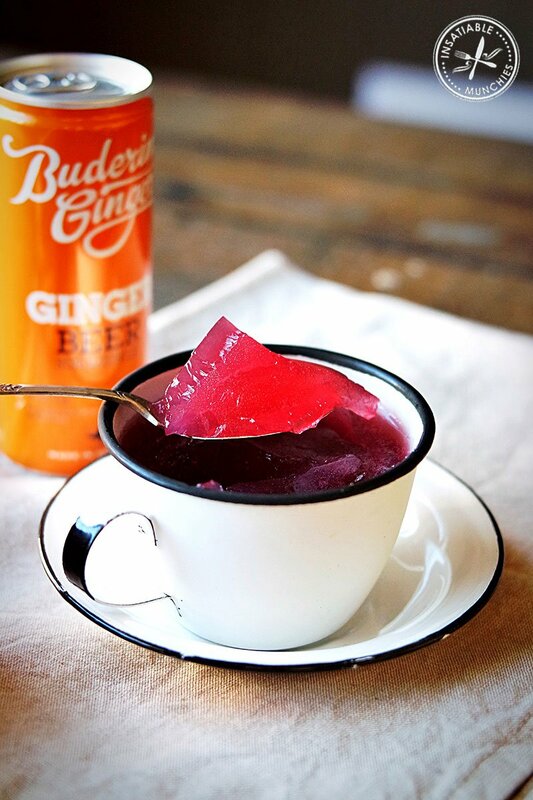 You can use mineral water, if you’d like, but I love the zingy taste of the ginger mixed with the berry jelly. Fantastic for a summer barbecue, or even as part of a jelly and fruit salad! Dissolves the jelly crystals into the hot water as per packet instructions. Let cool slightly, then slowly mix in the ginger beer. Don’t overmix it, or you’ll lose the bubbles! Then pour into your moulds – or serving cups – and set in the fridge overnight! Also, in celebration of all things ginger, Buderim is also on the search for Australia’s hottest Ginger! If you think you’ve got what it takes, simply head over to http://www.thegingernet.com to enter. Insatiable Munchies was given samples of Buderim ginger products for consideration. i love jelly and i love fizzy bubbles 😀 i must attempt this! This is just the coolest idea ever! I love jelly but this would be way better!!! Thank you for linking up with our Fabulous Foodie Fridays party!